Hire Whisky Comedian Alan Anderson for your Corporate Event. Alan Anderson’s critically acclaimed whisky tasting comedy shows are now available for private & corporate hire. Alan is able to tailor his shows to your requirements and those of your clients, be they native English speakers or international guests. 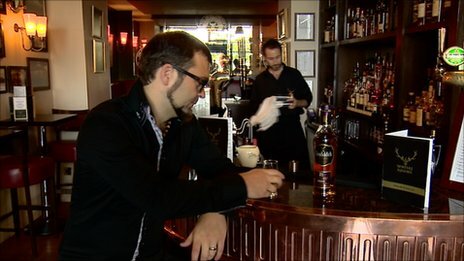 Alan’s Whisky For Dafties & Whisky For Drammies shows are so well regarded by the Scotch Whisky industry he has been given support from distilling giants Diageo (Johnnie Walker, Dalwhinnie, Glenkinchie), William Grants (Glenfiddich, Balvenie, Monkey Shoulder) and Interbev (anCnoc, Balblair, Old Pultney) as well as smaller brands such as Big Peat, Wemyss Malts and Australia’s Tasmania Distillery. In early 2012 Whisky for Dafties has been performed Glen Grant, Springbank and Ardbeg whisky distilleries as part of the Spirit of Speyside Festival and Islay Feis. Bespoke packages can be created on request. Here are the standard packages on offer for public touring shows. Corporate prices are available on request. Whisky For Dafties shows are perfectly suited to those who have little or no knowledge of the history or production of whisky. Everyone gets at least 1 whisky at the end of the show and during the show 6 audience members agent an additional Whisky and 2 others get 3 additional whiskies – £500+vat (if more than 30 people additional £5 per person above 30). Duration 60 minutes. Same show as Blended but everyone gets 2 whiskies at the end of the show – £600+vat (if more than 30 people additional £5 per person above 30). Duration 70 minutes. Same show as Blended but everyone gets to taste 6 whiskies – £450 plus £12 per person + vat. minimum 20 persons. Duration 2 hours. Whisky For Drammies is designed for those already with a love of whisky, who have a good knowledge of whisky history and production as well as having previously tasted a large variety of whiskies. Same as Premium Blended show where everyone gets at least 2 whiskies, but using older aged whiskies, rare bottlings or cask strength whiskies – £750 + vat (if more than 30 people additional £5 per person above 30). Duration 70 minutes. Same show as Cask Strength using older aged whiskies, rare bottlings or cask strength whiskies, but everyone gets to taste 6 whiskies – £450 plus £20 per person + vat. Minimum 20 persons. Duration 2 hours. All prices are subject to VAT (if applicable for your country). If your event is more than 60 miles from Glasgow additional costs are incurred for travel and overnight accommodation. If your event is overseas flights and two nights accommodation are required.